Yesterday, us Jamaican Seawolves (Ow! Ow! Owww!) took our final exam for MAR 388. After finishing our exam, one of us had the radical idea of jumping into the water. However, almost none of us had our bathing suits on. When life gives you lemons, you make lemonade. So, we jumped into the water in our clothes. I was a little late to the party, I took extra time to finish my final. I leave the testing site, and what a site to see. I take those 20 steps to the dock, and hesitantly look over. At first, I am somewhat skeptical and question whether or not I should join. Michelle, the honorary Jamaican, looks at me and asks, “When next will you take a final and have the chance to jump into the ocean 20 feet away?” At that moment, I instantly knew I had to jump in; she was right. To paraphrase my response, I said “Yeah, you’re right”, ripped off my shirt, and jumped in. It was great being able to laugh and rejoice with others after a long night of studying for our exam. A group shot. YA MON! Picture this, a group of college kids all laughing in our clothes, in the water. What better time to jump into the water, together than after a long night of studying. We line up, and jump into the water… well most of us. I just laugh as they jump. What comes next will shock you! Another sea wolf, Siobhan joins the party and teaches me how to belly flop. Naturally, we belly flop into the water and had a grand time laughing, enjoying the water, and just taking in the experience. Afterwards, we decided to dry off by spending time with a sea turtle. 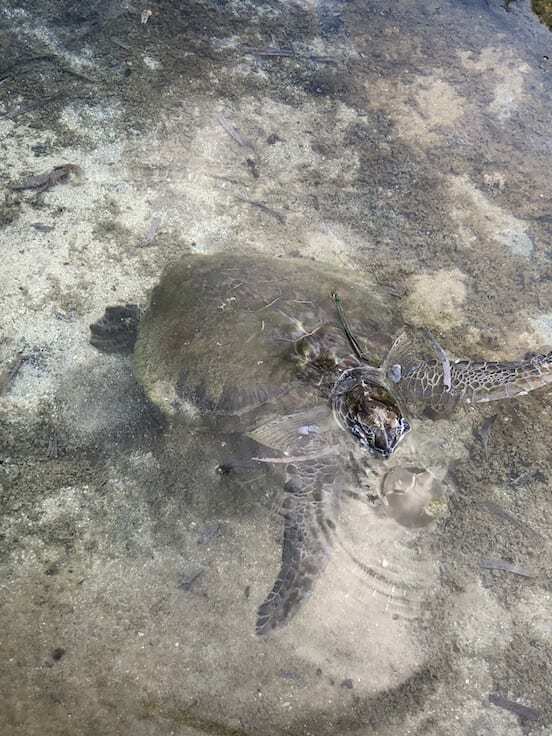 While were next to the mangrove nursery and we watched the turtle swim around for a bit. The turtle is a little sick, so the nice people here in the DBML are doing their best by catching jellyfish, and leaving these little turtle snacks around the pen. Overall, we definitely are leaving with more knowledge than we came with. This morning, a group of us decided to stay behind and look though the dock at all the little fish. Today we saw three huge princess parrotfish, adorned with the adult blue coloration. What a majestic sight to see. They swam around a lizard fish who just lazily laid there, as to say, “it’s my day off, don’t bother me”. My favorite site this morning was most definitely the school of juvenile butterfly fish just swim on by- as their eye spots stared back at me. This study abroad has been life changing. I have matured my sense of adventure, and more importantly, my appreciation for marine life and the ocean.